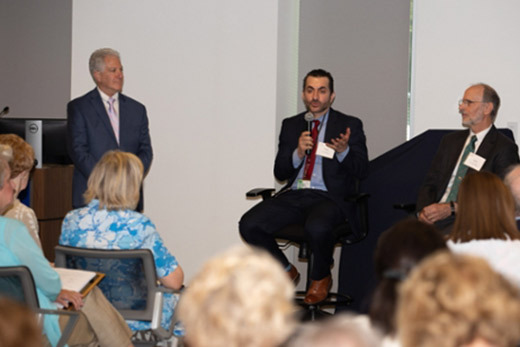 Recently, the Emory Brain Health Center hosted an event called the "Frontiers of the Brain" to discuss the link between the heart and brain health. On May 9, the Emory Brain Health Center hosted an event called "Frontiers of the Brain" to discuss the link between heart and brain health. The educational program featured Dr. Allan Levey, chairman of neurology and director of Emory's Alzheimer’s Disease Research Center, Dr. Ihab Haijar, director of Emory's Alzheimer’s Disease Research Center Clinical Trials Unit and Dr. Lary Walker, associate director of Emory's Alzheimer’s Disease Research Center. Attendees had the opportunity to hear about the latest breakthroughs in memory care and brain health. The Emory OGCA team is grateful to the state lawmakers in attendance, including chairwoman of the House Health and Human Services Committee, Rep. Sharon Cooper and Rep. Mary Margaret Oliver. The OGCA team looks forward to continuing to engage lawmakers at Emory events.